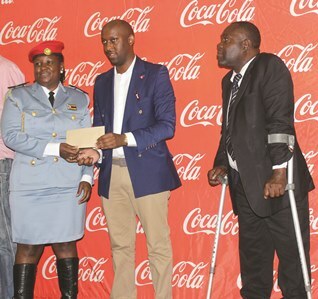 THE top five songs in the annual Coca-Cola top 50 were selected through a free and fair voting system by listeners, a presenter of the programme, Cain Chikosha has said. The selection process was under fire from members of the public who felt that upcoming, dancehall and other renowned artistes were short-changed. Most people argued that artistes who stormed the music arena and sent fans into delirium during the second half and the festive season of 2014 were supposed to be in the top five. The five best songs were by Leonard ‘Karikoga’ Zhakata who scooped the first and second prizes with his songs ‘Dhonza Makomborero’ and ‘Dollar Boy’ respectively, Mukudzei ‘Jah Prayzah’ Mukombe sat at number three and four with his songs ‘Kumbumura Mhute’ and ‘Makanika’ respectively. Female gospel diva, Fungisai Zvakavapano-Mashavave won the fifth position with her song ‘Gore Rapera’ with Amara Brown also honoured for the sixth position with her hit song ‘Kure’, both tracks featured Jah Prayzah. Expectations were that artistes such as Obey Makamure, popularly known as Tocky Vibes who made headlines with his song ‘Mhai’, Dr Tawanda with his hit ‘Unconquerable’ and Oliver Mtukudzi were supposed to top the charts. In an interview with Patriot Arts, Chikosha said most people did not understand the selection system. He said the winning songs were selected by listeners throughout the year during the top 20 best song competition. “It is not Radio Zimbabwe or Coca-Cola who select the top five best songs, but the listeners themselves through their vote/s,” he said. “Most people believe that the selection process starts end of year when in reality the songs are voted for starting January. Chikosha said each song that enters the competition accumulates points depending on its position and the period it has stayed on the charts. He said the more the song stays on top during the top 20 competition the more points it would accumulate. “Each song enters the chart at number 20 with one point and starts to accumulate more points as it is voted to the top position and the number one song accumulates 20 points,” Chikosha said. “These are the points that will be compiled at the end of the year to select the best song. In 2014 Zhakata’s first and second songs had 1 111 and 1 000 points respectively with Jah Prayzah number three and four songs accumulating 887 and 510 points respectively. Fungisai’s song had 422 points and Amara’s song, 346 points. Artistes of the top five winning songs walked away with cash prizes and hampers sponsored by Coca-Cola with Zhakata taking home US$2 000 for his two tracks. Listeners who predicted the winners won cell phones, radios and television sets. Meanwhile, preparations for the 14th edition of the National Arts and Merit Awards (NAMA) are underway. The award show slated for February 14 returns to the Sunshine City, Harare, at its traditional venue the 7 Arts Theatre in Avondale after two editions in the City of Kings, Bulawayo. “Preparations are on course,” the National Arts Council of Zimbabwe (NACZ) communications officer, Catherine Mthombeni said. The awards will run under the theme ‘Pride of Zimbabwe’. According to the organisers, NACZ, the awards are meant to stimulate and encourage creativity and quality to put the Zimbabwean arts on the regional and international map. However, the event has failed to attract the hype and glamour associated with other regional and international awards. Lack of glamour has been worsened by lack of monetary rewards or growth of fame and more opportunities that comes with clinching an award. Local artists have had to be content with a certificate and trophy. This year the organisers are optimistic that new sponsors would be joining the once prestigious award ceremony. So chances are the awards may just be bigger and better. Previous articleCrucify and bury the euro-god!